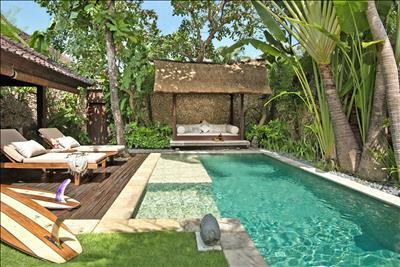 Step into the mystical wonderland of Villa 5, a discreetly romantic 1-bedroom private pool villa. Everything you could ever need is tastefully and harmoniously designed with authentic Balinese style; the furniture is upholstered in natural fabrics and a super-luxurious king-sized bed has views out over the pool. Outside, a large, open-air seating area with a teak wooden deck, verdant gardens framed with blooming Frangipanis and a sparkling swimming pool all offer simple pleasures in an idyllic haven. Guests can lounge on sunbeds by the shimmering swimming pool or lounge on the villa deck in the shade on a king-sized day bed and order delicious room service. 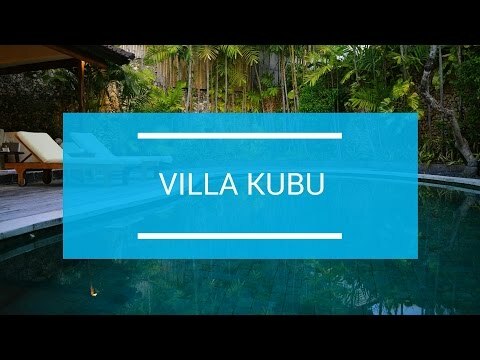 Those staying in Villa Kubu’s one-bedroom villas are carefully attended to by an expert team of staff always just a phone call away, and delighted to serve the daily á la carte breakfast in your villa, silver-service in-villa dining, poolside barbeques and banquets or the delights of the onsite Spa Venus. A discrete doorway in the garden allows this villa to connect to the two-bedroom Villa 6 to create three bedrooms, if desired. Everything was top quality from the facilities to the friendly attitude of all staff members. We hope staff get paid a fair rate for their hard work! Thank you. I will never stay anywhere else. Reception staff and office manager (Komang) are exceptional! I will never stay anywhere else. Honeymoon holidays (20 years wedding). Honeymoon holidays (20 years wedding) thanks a lot to "Made" for her hospitality even during her day off. Thank you very much for making our stay truly beautiful. Thank you very much for making our stay truly beautiful and very memorable. 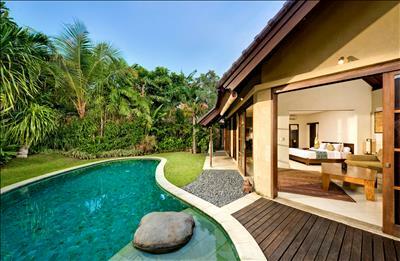 Will be recommending your villa. After so many times a still very beautiful stay. Dear Kubu Readers, we just visited a spectacular oasis of calm and such warm service. Will be back.